Marvel head honcho Kevin Feige seriously wasn’t kidding when he said that Avengers: Infinity War was the main event that the past ten years had been leading towards. Several solo movies, a few team-ups, and the odd collaboration with other studios have given us characters and stories that we have cherished with all of our geeky hearts, from the very first Iron Man all the way up to Black Panther, but now everything that we have come to recognise about the Marvel Cinematic Universe is being called into question, because a purple-skinned mad titan is coming to wreck it all. That would be Thanos, the big bad who has been teased and name-dropped ever since the mid-credits sequence to the first Avengers movie, and words cannot even begin to describe how much he is very much the gigantic threat he’s been built up to be. People online have made fun of how, in previous minor appearances in films like the first Guardians of the Galaxy, he’s just been sitting around on his massive throne not doing anything, but after this film all of that stops forever; he is a force to be reckoned with and then some, and proves so in just the first few minutes of screen time, which heartily demonstrate his ruthlessness and completely barbaric nature before the main title even pops up on screen. Right away, he puts the majority of the MCU’s one-off villains – a common problem that’s been noted in most of these films – to complete and utter shame, because not only is he an imposing but also incredibly threatening figure, brought to life through some fantastic CGI motion-capture work as well as a nuanced and calculated performance by Josh Brolin, but writers Christopher Markus and Stephen McFeely (on their fifth overall MCU movie, after penning all three Captain America movies as well as Thor: The Dark World, to date the least-adored Marvel movie by critics and audiences) have really taken the time to dissect the psychology of this popular comic character and find a small glimpse of humanity in his overall maddened sense of reality. Thanos, in this movie, is a highly complex and extremely well-written character who means business in every sense of the word, and when you see the things he does on his galactic odyssey to find those Infinity Stones, you’ll know exactly why he’s been built up to be the great villain we’ve been told he is. Thanos is undeniably the main character in this movie – or at least, the one who’s been graced with the most focus – while the heroes we have spent ten years and nearly twenty movies following are supporting players, merely reacting to every move that Thanos and his henchmen known as the Black Order make. Everyone who is anyone in this universe, with a few exceptions, makes an appearance here, from seasoned veterans like Tony Stark/Iron Man (Robert Downey Jr.), Thor (Chris Hemsworth) and post-Civil War Steve “I No Longer Identify As Captain America” Rogers (Chris Evans), to newer players like Doctor Strange (Benedict Cumberbatch), T’Challa/Black Panther (Chadwick Boseman) and Peter Parker/Spider-Man (Tom Holland), to popular characters like the Guardians of the Galaxy who easily carry the film’s much more humorous moments of relief. Don’t expect many of them to get much in terms of character development here, though, partially because of the very fact that there ARE so many of them – I counted at least 35, which is a lot of characters to focus on even in the lengthened running time this movie has – not to mention the fact that there have been eighteen films before this that have gone far more into their backstories and personalities. It’s not like this is a situation that requires all of these heroes to confront their egos and inner demons in order to win the battle; there just isn’t time for any of that, because the threat that Thanos poses is so great and immediate that to do some soul searching in the midst of potentially apocalyptic warfare would be a complete waste. Instead, they must all engage in the biggest fight of their lives, and from the very first scene onwards it’s made clear by directors Anthony and Joe Russo that nobody, no matter how beloved, is safe from death’s embrace. Having previously upped the ante with the action and character drama in both previous Captain America movies, the Russos have been given a much larger canvas to work with, one that incorporates everything that the MCU up to this point has been leading towards, and they take heavy advantage of the epic scale that this culminating story provides to give it a seriously operatic tone which helps to emphasise just how grand and dramatic the whole thing is. Everything, from the action sequences to quieter character moments that feature these actors giving some of their best performances as these characters, is purely and undeniably epic, to a point where you’re almost left exhausted by the sheer scope of it all, but always enthralled by how this studio and the talent put in charge of it have been able to make it work as well as it does. 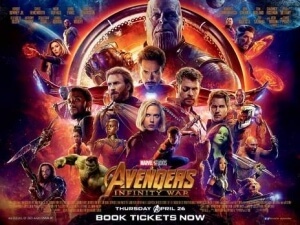 Even with this many characters to work with, the Russos miraculously give each and every one of them at least one major moment to shine, and with the help of some stunning visual effects artists, a cinematographer with a gorgeous eye for all the chaos and destruction, and a swooping score by Alan Silvestri, they bring the Marvel Cinematic Universe as we know it to a resounding and emotionally hefty climax. Avengers: Infinity War is a breathtaking and epically operatic climax to the entire Marvel Cinematic Universe as we know it, containing all the action-packed and adventurous mannerisms we’ve come to expect merely cranked up to eleven, while also formally introducing Thanos as the barbaric, intimidating and thoroughly complex villain he’s been built up to be from the very beginning of the MCU.